Extensively re-furbished in Mountain Style for the 2015 season, Chalet Muguet still has the same stunning location and views, but now boasts more luxury and comfort for our guests. Hot tub ideally located on up-lit decking immediately outside the chalet with great views across the town and valley. Soft leather seating by the wood burning fire has a large L shaped sofa by Darlings of Chelsea finished in soft Selvaggio leather surrounded by cushions, animal skins and faux fur blankets, decorated with an original neon wall installation. Smart flat screen TVs on all levels provide UK satellite TV or DVD, plus wireless Sonos and ipod /CD player can be used to play your own content. A spacious wooden dining table seats 10, enjoying double-aspect views across Morzine town and the surrounding valleys, and access through doors to the double-aspect balconies. The kitchen has masses of equipment for large scale catering and easy access to the dining area for communal cooking. Double doors lead onto an additional south-facing private sun deck which is simply stunning for coffee, lunches or BBQ. Talking of coffee, a DeLunghi machine will steam up an expresso or cappucnini on demand! If you want Haut Savoir style, use the pierre rade. (Hot Stone) and order meats from the butcher on Route du Thonon. All the beds are singles. Of the four bedrooms, two have en-suite and the other two share a family bathroom. Two bedrooms have three beds and two have two beds. Each bed has fresh white linen sheets, pillows and duvets of hotel-quality 400 thread Egyptian cotton. Set in the heart of the Portes du Soleil, the largest linked ski area in Europe, Morzine is the largest town situated close to the Swiss border . 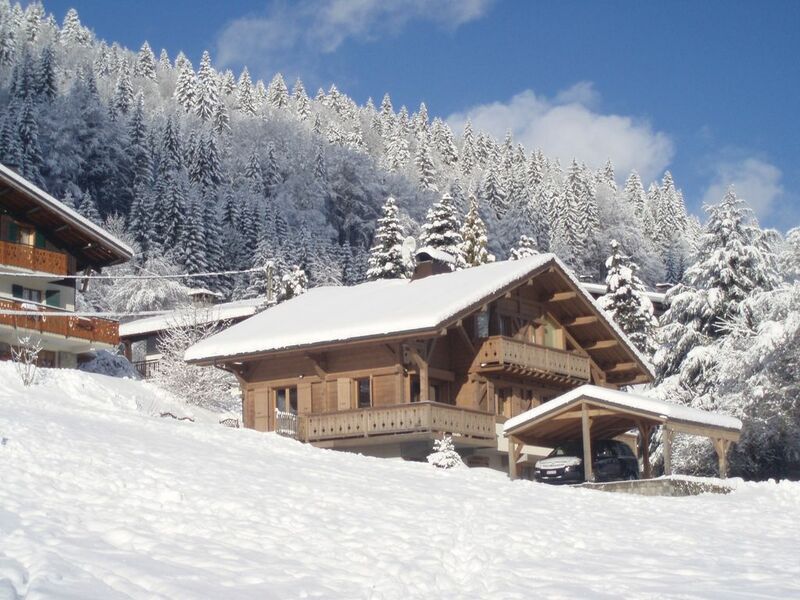 Chalet Muguet is in a fantastic hillside position just a couple of minurtes walk from the bustling centre of Morzine, with easy access to shops, bars, markets, restaurants, night-life and sports complexes, making it ideal for summer and winter holidays. Located on the Pleney slopes which can be reached on skis from the Piste B blue run, the chalet has stunning views across the town and the valley, with easy access to all main lifts, including the Pleney gondola lift to Les Gets, and the SuperMorzine gondola which provides direct ski access to Avoriaz , to reach the highest skiing in the Portes du Soleil. In addition these lifts provide on-ski access to all 14 major ski areas within the Portes du Soleil linked ski area, and there is no need to travel either by car or Navette (the free ski bus service) to access them from the chalet. Chalet Muguet was built to our specification in the year 2000 and has been equipped and furnished to a high standard with spacious self-catering kitchen & larger than average accommodation over three floors. One bedroom is encased in glass, for a light & airy effect . You will love to eat in! Two balconies, a south-facing deck and picture windows capture dramatic views up and across the valley encompassing Nyon, Avoriaz and the entire town of Morzine. Although the chalet is self-catered, there is a very full inventory of cooking equipment and the kitchen is open-plan, allowing meal preparation to be a convivial affair. We also are able to recommend some very fine local chefs who provide an in-house catering service by arrangement if you wish. The Lowrie family had already skied Les Portes du Soleil area for 10 years before we finally decided to base ourselves in Morzine; a decision we have never regretted over the following 15 years of ownership. We had the chalet built to our specification by a local wooden chalet builder. We continue to love every minute spent in the resort, and relish the opportunity to share the serentity of our chalet with friends and relatives from all over the world. One of the finest sites in Morzine. Wonderful views yet also close to all facilities in the town. A very sunny location with great views across the town and up and down the valley. Within a couple of minutes guests can walk to bars, restaurants, hotels and shops. Personally I love the morning walk to the boulangerie even if the car is in the drive. In winter there is a joy to skiing in from Piste B which runs behind us, crossing a field and arriving at the front door on skis!. In summer the area attracts the local horses which roam free in adjacent fields.At all times the serene views across the valley and the town make it a spectacular place to relax. We have double hot water tanks installed and rarely run out of hot water. Traditional wood burning stove ibn the corner of the soft seating area, surrounded by luxurious leather sofas, skins and and soft rugs. Very fully equipped. The kitchen is open plan with views across the dining area and sitting room so a very communal atmosphere is possible when preparing meals. The dining area has a large wooden table with double aspect views over the town to the valleys to the South and East, and up to Avoriaz and Nyon ski areas..
We travelled in a fairly large group and had more than enough space, great location close to Morzine town and lifts, we stayed in the same chalet last year and will book again. Great location. Lovely living space. We will be back! So glad you left it. We do too! What a find! We were a group of 10 (8 adults, 2 kids) who spent a week here. The chalet has everything you could need for a comfortable weeks stay including a great hot tub overlooking the slopes and games for all ages. We didn't take advantage of the ski in ski out but this would have been feasible with a short off piste run from a long Blue. The chalet was clean, had everything we needed and a huge bonus was the jacuzzi (which was clean with new clean water for our arrival). David was very responsive and helpful. The chalet location was great, with easy pickup and drop off from from the airport. Morzine has a lovely town centre which had fireworks for new years eve. Excellent to receive your views! Thank you and you are most welcome to book again. This is a gorgeous chalet equipped with everything you could possibly need. The beds are very comfortable with lovely crisp linen. Just a short walk into town and to the 2 ski lifts. Loved it! Thank you for your feedback and of course we are very glad you enjoyed your stay! Morzine has the easiest access of all the alpine resorts, located just 30km from Thonon on the shores of lake Geneva, and 25km from the A 40 AutoRoute which skirts the city of Geneva. Drive time to Geneva airport is just over one hour. Morzine is twinned with its sister resort Avoriaz to combine the best of high alpine skiing with traditional Haute Savoie village atmosphere. Having been established as a ski resort for 80 years, Morzine is the largest of the 12 resorts in the Portes du Soleil. creating one of the finest ski playgrounds in the world, with 700 kms of piste served by 230 lifts. Ski: This property is ski-in, being located just 200 meters from the Pleney lift, and 100 meters below the piste which returns to Morzine (subject to snow conditions). A 5 minute walk provides access to gondola lifts which connect to either the Morzine/Pleney/Les Gets ski area, or alternatively to Super-Morzine, Avoriaz, and the vast Portes du Soleil ski area.Free ski buses link to all other areas in the 14-resort Portes du Soleil. There is no need to use a car in the resort, but if you wish to drive to different areas, a 15 minute journey is all it takes to reach Les Gets, Ardent(for Les Linderets), Nyon for Les Gets or the telepherique to Avoriaz. All types of skiing and snowboard abilities are catered for in the area, with dozens of moderate pistes accessible from Pleney, more challenging off and on-piste skiing and boarding in the Avoriaz area, while long distance ski touring through combinations of the French and Swiss resorts is especially rewarding. It is perfectly acceptable to pop over to Switzerland for lunch, and on the pistes, passports are not required!